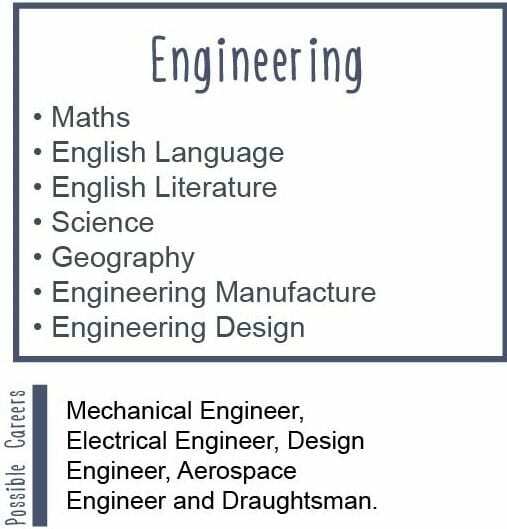 The UTC curriculum is characterised by a wide range of Science, Engineering, and Creative courses, alongside core national curriculum subjects. The programme we offer is underpinned by personal and employability development. Throughout their time at UTCW, students will build knowledge and contextualise their learning through our network of employer partners. 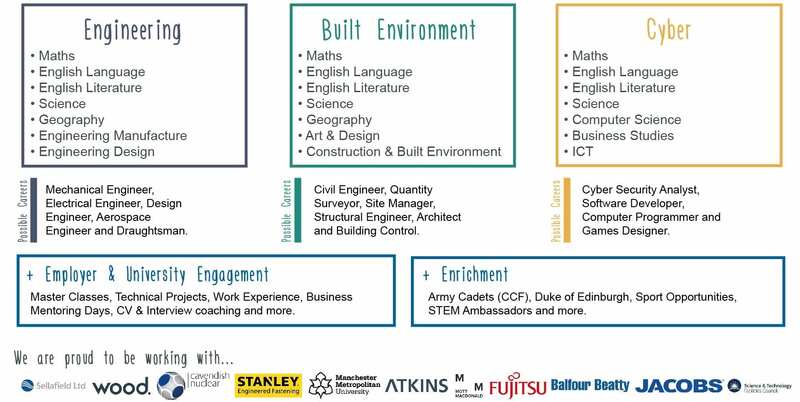 This is done through work experience opportunities, guest lectures, and employability embedded throughout the UTC. Students will select their preferred pathway and be supported by industry specialists during their studies. From 2018, our students will gain access to a professional mentor, comprising of local employers, business leaders, and community champions who have a passion for supporting young people. Our mentors will meet with students throughout the year to discuss their academic reports and offer professional guidance to demonstrate how students can achieve their best possible academic success, and subsequently contextualise how their effort at UTCW will translate to high level apprenticeships and employment. Alongside the UTC curriculum, we have a strong focus on personal development and activities that can support the integration of softer skills that employers look for. Our enrichment activities allow students to spend time taking part in activities that they enjoy. These include boxing, young enterprise, cultural club, and long term projects such as the Water Aid Challenge. All of our enrichment activities allow for the development of key personal attributes such as presentation skills, leadership qualities, financial management, and resilience. Once per year, we drop down the timetable at UTCW for the annual enrichment week. This is an opportunity to extend student knowledge and experiences by enhancing areas of the curriculum not covered in standard lesson time. We are joined by our employer partners who support in producing mini challenges, skills workshops, and site visits. Mathematics at UTC Warrington gives students the opportunity to progress at their level. Students at KS4 explore topics looking firstly at their prior knowledge and then students build upon this, identifying key points for learning, then apply this to problem solving and reasoning tasks. These are important skills, not only for GCSE, but also in everyday life. Discussion is another key part of their mathematics both verbally and written as they explain their reasoning to solutions. There is an emphasis on problem solving and the application of their skills. English Language is the study of the language we speak, read and write, in a huge variety of forms. You will explore a wealth of materials from newspaper articles to online blogs, and learn to write about a number of topics for different audiences and purposes. English Literature is an opportunity to read and discover other worlds through a variety of texts such as novels, poetry and plays. We explore modern texts, and older texts, from Shakespearean plays to 19th century novels. We discuss and research authors and their influences, and analyse writers’ intentions and effects. Science is a set of ideas about the material world. Whether it be investigating, observing, experimenting or testing out ideas and thinking about them, the way scientific ideas flow through the GCSE course will lead to a deep understanding of scientific ideas. As a specialist STEM college, we encourage our students to combine logical and scientific ways of thinking with the technical engineering expertise. Many of our employer partners, including Sellafield and Cavendish Nuclear, are seeking engineers with scientific specialisms and backgrounds to support their purpose and operations. Combined Science is worth two GCSEs and consists of six exam papers across the syllabus. Students will study a mix of biology, chemistry and physics. Separate Science is worth three GCSEs and consists of two exam papers per subject – biology, chemistry and physics. Geography is an exciting course that allows students to investigate the link between physical and human geography the two themes, and approach and examine the battles between the man-made and natural worlds. Challenges of Living in a Built Environment: What influences quality of life in urban and rural areas? What is the pattern of housing and services and how does this create inequality. Why are people moving to cities in poor counties and out of cities in rich countries? Physical Processes and the Relationships between people and environments: What shapes the weather and how does the weather affect what we do. How will it change in the future with climate change? How do flooding and the shortage of water affect people around the world? How do we use and abuse ecosystems. Uneven Development and Sustainable Environments: How will employment patterns change in the future and how will this be influenced by globalisation and the technological change. How do multinational companies affect people and the environment? How does the pattern of trade and aid affect people’s lives? Engineering Manufacture is a discipline of engineering that deals with different manufacturing practices and includes the research, design and development of systems, processes, machines, tools and equipment. This qualification has been developed in consultation with employers and professional bodies to confirm that the content is appropriate for those interested in working in the sector. The course content includes working safely as a team, product design, computer aided manufacturing (CAD), CNC machining, and a long term engineering project. Engineering Design is a process used to identify market opportunities and solve problems which contribute to the development of new products and systems. This qualification is aimed at learners who wish to study the processes involved in designing new engineered products and the requirements of a design specification. Through research and practical activities, learners will understand how market requirements and opportunities inform client briefs and will use practical skills such as drawing, computer modelling and model making to communicate design ideas. This qualification is an opportunity for students to develop a design specification and study the processes involved in designing new engineered products. They’ll use practical skills such as drawing, computer modelling and model making to communicate design ideas. The qualification will also encourage them to consult with a client and, with its practical focus, will engage them in producing, testing and evaluating a prototype in the form of a model. Art & Architecture is a course that allows students to develop their knowledge, skills and understanding of how Art and Design is utilised within a creative and visual world. 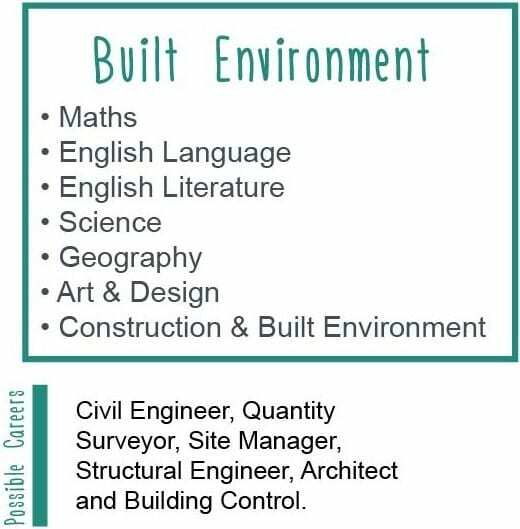 All Units are underpinned by an interest in engineering, architecture and the built environment. Students will develop their drawing ability, subject knowledge and understanding of colour, line, form and process. At GCSE, learners will also use their creativity to study habitats and environments with a focus on architecture processes to aid their own design and structure. Students at UTC Warrington have the opportunity to continue from GCSE onto A Level Art and Design, with our Art and Design curriculum specialising in Architecture, 3D modelling, media, and creativity. Staff have a wealth of subject knowledge and experience and are supported further by links with Universities and a wide variety of established practitioners. We believe wholeheartedly that Art and Design has the power to not only enrich our curriculum, but to develop our students as innovators and creative problem solvers who understand the potential of their own imagination. Construction & the Built Environment is a course that provides students with a realistic understanding of construction and civil engineering processes as part of a Key Stage 4 bespoke programme. Students will gain a great understanding of the world-of-work through the application of theoretical knowledge. Students will also have the opportunity to contextualise their theory with a range of practical experience. Students will benefit strong connections in the civil engineering industry and their skills in architecture and design will ensure that learners can confidently progress into further study, training or employment. Computer Science looks behind the everyday computer systems and the engineering and productive capacities of computers. Topics covered on the course include programming, software development, and the fundamentals of computer networks. Students will be assessed on their ability to analyse problems and to design, develop, and evaluate solutions. Computer scientists design new software, solve computing problems and develop different ways to use technology, alongside designing and analysing algorithms to solve programs and study the performance of computer hardware and software. In the modern technological world, students will be able to identify the ethical, legal and environmental impacts of digital technology on wider society, including issues of privacy and cyber security. Business Studies students apply their knowledge and understanding to different business contexts ranging from small enterprises to large multinationals and businesses operating in local, national and global contexts. Students develop an understanding of how these contexts impact on business behaviour. This course encourages students to think about businesses in the real world with their functional operations and management. Content in this GCSE subject includes business ownership and the structure of a modern business, the purpose of a business and its intended outcomes, leading and running a business, marketing and operations, and human resources. A business studies qualification provides students with the expertise and knowledge to be successful leaders of a business, with sound understanding of the roles within society and the importance of teams and people management. ICT has been developed in the IT sector to provide opportunities for learners to gain a nationally recognised qualification. 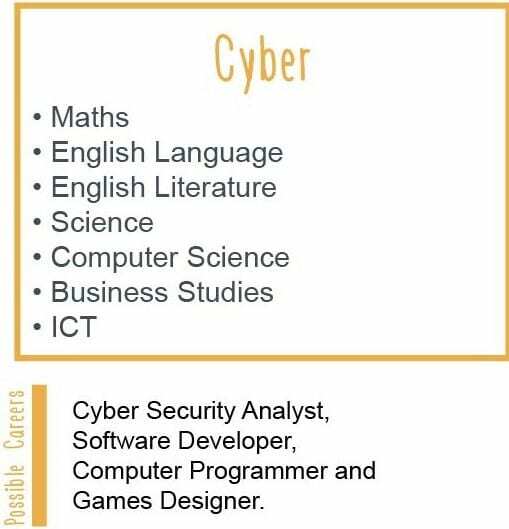 Those who successfully complete this course can choose to enter employment in the IT sector or to progress to Level 3 studies. The course provides opportunities for learners to develop a range of skills and techniques, personal qualities and attitudes essential for successful performance in working life. Topics covered on this course include multimedia products development, website development, functions of databases, and mobile apps. Students learn by completing projects and assignments that are based on realistic workplace situations, activities and demands.